WZ4002 is EGFR inhibitor against EGFR T790M (mutation of the gatekeeper T790 residue) which is detected in 50% of clinically resistant patients to gefitinib or erlotinib. 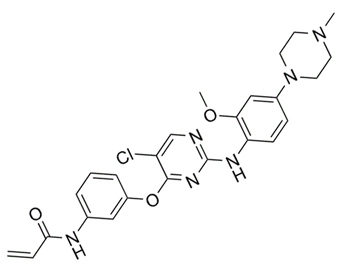 WZ4002 has a basic chemical framework (covalent pyrimidine) which is different from that of other EGFR inhibitors. This agent is 30- to 100-fold more potent against EGFR T790M, and up to 100-fold less potent against wildtype EGFR, than quinazoline-based EGFR inhibitors (HKI-272 and CL-387,785) in vitro.
. Zhou W, et al. Novel mutant-selective EGFR kinase inhibitors against EGFR T790M.Nature. 2009 Dec 24;462(7276):1070-4.